Sindh assemb­ly approv­es Sindh Laws Amendm­ent Bill 2012 changi­ng offici­al spelli­ng of the provin­ce's name. KARACHI: The official spelling for the province Sind will now be Sindh. Radio Pakistan had earlier erroneously reported that the spelling had been changed to Sind. 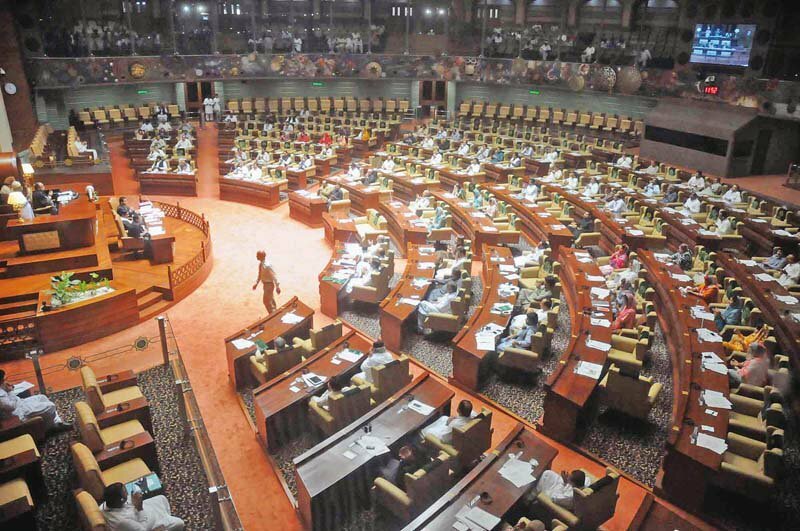 The provincial assembly approved Sindh Laws Amendment Bill 2012 which adds the letter “H” to the province’s spelling, as substituted by the Constitution (18th Amendment) Act 2010. The 18th Amendment of the Constitution corrected the name of the Province of Sindh from “Sind” as the British Empire spelled it to “Sindh” to reflect more accurately the actual pronunciation of the word by the people of the Province. This Act shall bring all legal documents issued in the Province into conformity with the constitutional Amendment. In 2010, the name of the province North West Frontier Province (NWFP) was changed to Khyber-Pakhtunkhwa. Correction: A reporting error occurred wherein it was stated that Sindh will be written as Sind. The error is regretted. Parties celebrate nationalist leader’s birth anniversary, say they will continue his struggle. Students of the Asian Institute of Fashion Design make their way into the textile industry. semantics, dont we spell it with a “hay” at the end in urdu?…. karachi is burning and this is the best they could come up with? Arabs spellings weight more than those of ancestors,shame! What a remarkable achievement by “Sind” assembly !!! In all these last 5 years, they have come up with this glorious idea of benefiting common people in Sind. People! you know that I am joking? Ain’t I? Which one is correct, Sind or Sindh? Now what: again print new stationary. Why can these members of Sind Assembly not discuss and solve the problems of law and order, un-employment. Please forget you language too and accept Arabic as you have accepted Arabic script instead of Devanagari.Shameful act by the Sindh assembly and its the insult on the native Hindu minorities.Native Hindus in Sindh felt proud due to the name the province.Pakistan a most bigoted fundamentalism intolerant country on earth. Doing such Insulting things to your minorities you want Aman Ki Asha with India.Shame on you Sindh Assembly. Wow! what a big achievement. Dozens of people die every day and all they do is change the province name. Y U no stop target killing in Karachi? Let there be a standing ovation for this work of greatness ! And this takes precedence over other issues? People are getting killed everyday and all these odious representatives can think about is how to spell? Brilliant !! Bloody brilliant !! What’s next ? Kolachi instead of Karachi ?? What an achievement by Sind Assembly. They should make some policies for current law and order situation in Karachi,make some logical actions other then block mobile phone network or ban on pillion riding. But they are wasting time on such useless issues. Insulting minorities shame on Sindh Assembly. I wonder why is everyone so disturbed at this. Sind has always been known to locals as sind, it was only after creation of Pakistan when urdu was made the official language of the country due to which many places lost the names that originally their native used to call them. Another case is Lahore. Its english and punjabi pronunciation is same but when it comes to its official name which unfortunately is in urdu it is pronounced as Laahore. Arabanization & Islamization of Sindh,Insult to History, religion,culture,traditions of Hindu minorities. Why not al Sind? Just Sind seems neither here nor there, kind of like the rest of Pakistan. What’s the point of this? Will we also change Urdu and Sindhi spelling? Will Sindhi language now be known as Sindi? Since our MP’s have so much time on their hands debate this issue as well. Yipppppppeeeee… now all our problems are solved.. Hay Jamalo…. Government top achievement, Now they get the time to focus on other issues. 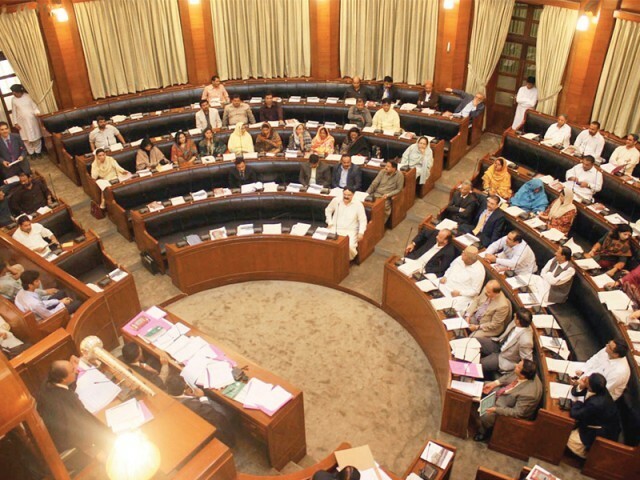 Sindh assembly has Insulted Sindhi language and Insulted Hindu minorities by adopting Arabic name. I still remember that long time back there was a notification came from one of the PPP previous Government of Sind to change the spelling fron ‘Sind’ to “Sindh”. Now after so many years the sitting government of PPP again has changed the name from ‘Sindh’ to “Sind”. If this is the level of Government of Sindh/Sind, what will happen to Sind in the future. The government cannot stop target killings in Karachi and more keen to keep on changing the name of the Province from “Sindh” to ‘Sind’. For all the Indians without any knowledge. Please refrain from passing any negative comments here. SIND was the official name of the province till the early 90’s when ppp ( benazir) government has changed it to SINDH , now they change it back to sind . Do you have any problem with it . Pakistanis has not passed stupid comments when you guys change the name of Bombay to Mumbai or banglore to bangluru. What is financial cost of the change? Looks like a small administrative change however have significant financial implications. For a country like Pakistan which begging in the world to make the budget this is criminal? These are the gimmicks and emotional tactics our politicians use to keep the people busy, while they loot and plunder. Why my comment is blocked by express tribune? hahahahaha wow what am important issue the have resolved? Great Legislators! I can tell you even the new spellings of Sindh (Sind) wouldn’t fit well in Sindhi (Sindi) language. Imagine writing “Sind” in Sindhi as a name, and you will feel it like an incomplete name/word. Arabs who attacked Sindh, called it Al-sind. So by removing h, the name becomes closer in semantics to its arabic name which is however disturbing and disrespecting the people who for thousands of years loved sindh and sindhu. The attempt is to remove all the signs which lead to history and culture of original Sindh which has remained multi-cultral though with Hindu majority but mostly peaceful, tolerant and progressive. As the original name of Karachi was changed from Kolachi to karachi a long ago and the historic graves of fish-farmers were demolished few years before, now it’s the purification of Sindh from its hisotic and cultural heritage to islamisation. The province was a nation before the British annexed it. They named it ‘Sind’ province, & that name was changed to ‘Sindh’ in 1955. The fact that we’ve adopted the Arabic name for it is rather insulting to the native religious minorities. After all, these minorities do deserve more of a say in the affairs of their province than some Muslim migrants. Alas, nothing is correct in neither Sind or Sindh!!! Yesterday Mali Tombs, today Sindh to Sind – tomorrow what? Farhan : Pl note that in India, names were changed to their original Indian names which were tongue twisters for British. Just to get rid of that legacy, names of Indian cities were changed. Sindhudesh is a man made nonsense. Have a nice day. Just wondering though – why in the picture on top, sind or sindh a part of India? Hi, I’m a Sindhi and I refuse to be called Cindy. I urge the Sindh assembly to rename Sindh to Sindudesh(original name) given to it by the original inhabitants of Sindh. All the English texts of British India refers the region only as Sind. I prefer the spelling “Sindh” as the letters “DH” together brings out the ending hard native sound properly in English. I want to see an advertisement from Information Ministry claiming achievement and service to Sindi people. So whatever lawlessness we witnessed was in Sindh. Sind is a fresh start!! Sindhu,India,Indus,Hindu all of these are same it represents Hindustan. Don’t insult minority Hindus (original natives of Pakistan)click on the below link to know the truth. Once it was part of United India. Is urdu is dying in pakistan? And how will they spell the Mohajir province….Mahajirstan or Mohajirstan or Muhajirstan? For your kind information the assembly proceeding have been misreported. The amendment has been made to endorse the 18 Amendment which has officially declared Sindh not Sind. SIndh Assembly members following the spirit of 18 Amendment have also made a law to correct the name of the province from Sind to Sindh. I even suggest to drop ‘D’, as she has become a ‘Sin’ of political parties. This is another attempt to islamize SINDH and another attempt to uproot the roots of indigenous peoples of SOIL.Condemnable Act. Pah !!! earthshattering change of heavy importance. -desh sounds to you man made nonsene and not -istan? Sindh in Sindhi and Dravidian languages, which means land of Sindhu river. it is more then 15000 years old word. no dear. “Sapta Sindhudesha” was a kingdom in 700 BCE. which means “Sindhu country of 7 rivers”. but now Sindh do not have 7 rivers. so its only Sindhudesh.! Excuse me: correction! The word Hind, Hindi, Hindvi, Indus and India are all variants of Sindh which was a separate country through much of history and gave India its name due to the speech limitations of Greeks. Not the other way around. Lets call it al-bin-Quasim-Stan after its founder. Good to see that Pakistan is seriously tackling those issues that matter the most. We must make it our duty to add that ‘H’ at any cost. It seems trivial, but the name of the province as used in passing provincial laws must match the wording used in the constitution. Since the spelling was changed by the 18th amendment, it was a legal requirement to ensure uniformity. The other affected provinces have all passed similar legislation. It doesn’t seem like exciting legislation or directly affect the common man, but sometimes legislation such as this is required for legal and constitutional purposes. whilst we enjoy our rides and commutes on metro bus, let the sindhis make progress and achievements by adding H to their name. A sensible and honourable move. I always felt a bit uncomfotable with the ‘h’ in Sindh. The name has been changed from ‘Sind’, which was the spelling the British gave, to ‘Sindh’. Why exactly are all the Muhajirs bitterly commenting on this as if it applied to them?